Thrombocyte is another word for platelet, the blood cell that is responsible for normal blood clotting. The root "thrombo" means clot, and you will see it used with diseases and conditions that affect the platelets and blood clotting. Platelets originate from cells known as megakaryocytes, which are found in the bone marrow. They are important for normal blood clotting. This means that when there is a break or cut in one of your blood vessels, they adhere to the site, send out chemical signals for more help, and connect to each other to form a plug. Once a plug is formed, the coagulation (clotting) cascade is activated which adds fibrin to the clot, to hold it together. A real-life example of normal blood clotting is if you cut your finger and it stops bleeding, but it also happens in blood vessels throughout your body. If there are not enough platelets (a condition called thrombocytopenia) the risk of uncontrolled or prolonged bleeding increases. When there are too many platelets in the blood (a condition called thrombocytosis), it may lead to abnormal blood clot formation, which can be serious and life-threatening. Aspirin and some non-steroidal anti-inflammatory drugs inhibit platelet function, which is why you may be asked to stop using them for a period of time before a surgery or procedure. Looking at the numbers, size, and health of platelets (thrombocytes) is a part of a complete blood count (CBC) test. A platelet count is an important number for your doctor to know before and after surgery in order to predict bleeding and clotting problems. It is also an important number during chemotherapy and radiation therapy as these can inhibit the production of platelets in the bone marrow. Platelet Count (PLT): normal range is 150-450 103/microliter or 150,000 - 450,000 per microliter. Mean platelet volume (MPV): the average size of the platelets. Younger platelets are larger than older ones, so an elevated number means you are producing and releasing them rapidly while a low number means altered production in the bone marrow. Platelet distribution width (PDW): the variation in the size of the platelets, which can indicate conditions that affect the platelets. Platelet function tests may also be performed if there are symptoms or potential for excessive bleeding, and to also monitor anti-platelet medications. What Causes Thrombocytopenia, a Low Platelet Count? There are a number of potential causes for a low platelet count. When you undergo chemotherapy or radiation therapy, you may have a low platelet count due to the suppressive effects on the blood-producing cells in your bone marrow. A platelet count below 20,000 per microliter is a life-threatening risk as spontaneous bleeding may occur and be hard to stop. At that level, you may be given a platelet transfusion. 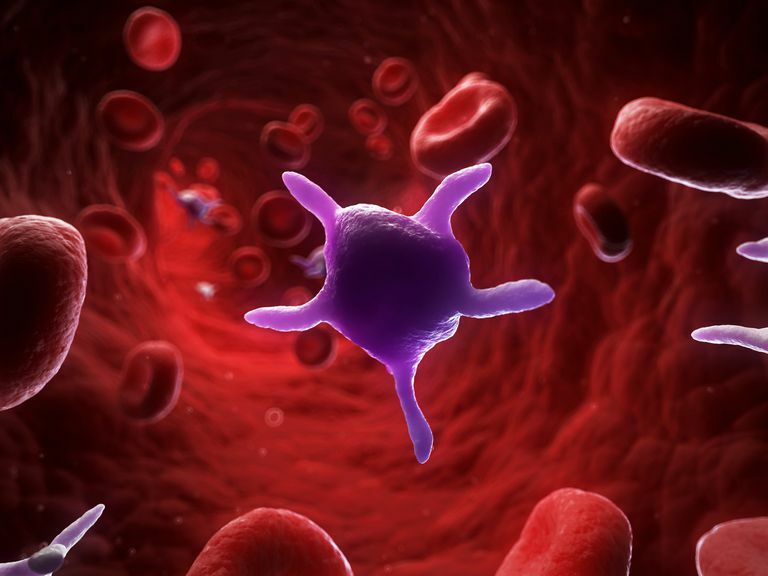 High platelet counts can occur from a primary bone marrow disorder (for example, essential thrombocytosis) or as a result of chronic inflammation in the body, infection, iron deficiency anemia, or removal of a person's spleen. High platelet counts can also be seen in cancer, especially with gastrointestinal cancer, as well as lymphoma, lung, ovarian, and breast cancer. This is thought to be due to the inflammation associated with the malignancy stimulating the production of platelets in the bone marrow. Other conditions that may show thrombocytosis include inflammatory conditions such as rheumatoid arthritis and IBD. In addition, a temporary increase in the platelet count can happen after a major surgery or trauma. American Association for Clinical Chemistry. Lab Tests Online: Platelet Count. Gauer RL, Braun MM. Thrombocytopenia. Am Fam Physician. 2012 Mar 15;85(6):612-22. Ioannis A Voutsadakis. Thrombocytosis as a prognostic marker in gastrointestinal cancers. World J Gastrointest Oncol. 2014 Feb 15; 6(2): 34–40.